According to Morris Berman, we have literally lost our senses--not our minds but our bodies--because we have denied our physicality. In his provocative analysis of Western society, Berman explores the relationship between our physical experience of the world and the larger culture of which it is a part. He evaluates the studies of infant behavior in front of mirrors, analyzes the iconography of human/animal relations from cave paintings to Disney cartoons, investigates esoteric breathing techniques and other occult rituals, and examines the nature of creativity. 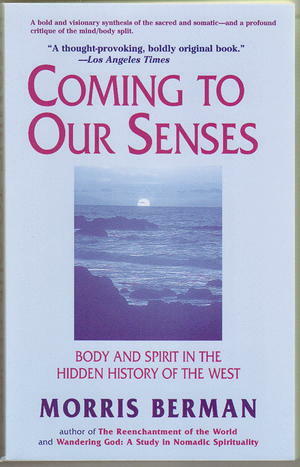 Uncovering the "hidden history" of somatic experience, Berman shows how Christianity had its origins in Jewish "ascent" techniques, how the idea of romantic love grew out of medieval Christian heresy, how modern science arose from Renaissance mysticism, and how Nazism was the most recent episode in a recurring cycle of orthodoxy and heresy. A radical and unconventional work of history and philosophy, Coming to Our Senses is a landmark effort to integrate thought and feeling.